deathradio wrote: I'll probably have to do this again when my two kilo coins come in next week. Isn't there some sort of service where you can collect packages from the depot yourself in the USA? We have several services like that in Europe. That way they save on delivery, and you are sure to get your goods. That's what a PO Box is. It's a mail box for you at the post office instead of at your house. No, I mean like you can get packages delivered to other places/businesses, so that you are not limited to receiving the volume that will fit into the PO box you rented. For example, I get packages delivered to a supermarket near me, and it doesn't matter what size they are. Furthermore, it's cheaper than delivering to a PO box (which seems to cost the same price as a delivery to a private address + the cost of renting the PO box). I'm not aware of anything like that here... we do have UPS locations that will accept mail, but I don't know what they charge. Even if we did, I'm not sure I'd want my coins going to the supermarket..
toddler81 wrote: I'm not sure I'd want my coins going to the supermarket..
Just Have the supermarket deliver your PMs to you along with your Oreos and Lucky Charms! I'm Finally the owner of All the 5 oz Pucks that Swiss Of America Made. It sure is a beauty! Check this one out. This is a tough one to get. It is 1 of about 300 that ended up having the error on the back. Obviously it isn't 1oz of copper. Check out this video if you want a chance at winning something. 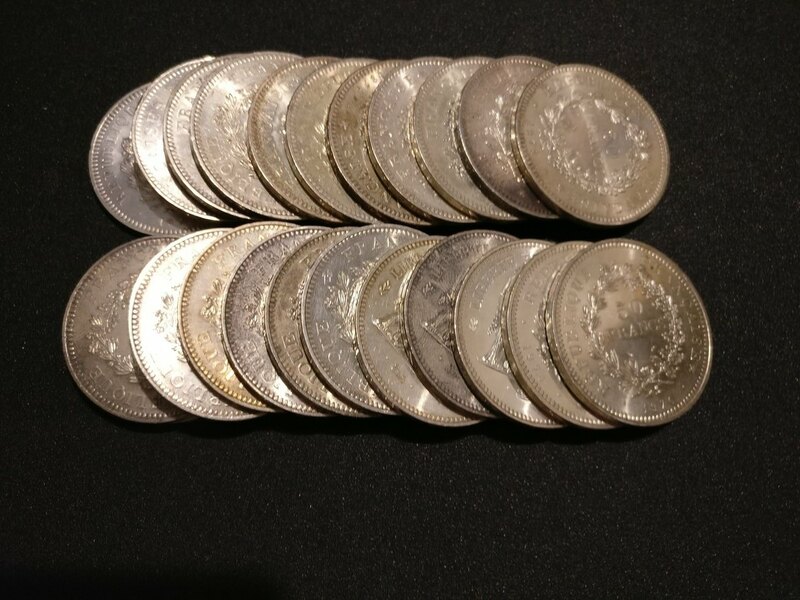 bejon wrote: Just bought a roll of 2008 maple leafs (25 coins) for $425! $17 an oz!!! The original post on this thread is above and was from 2009. I am looking at the Provident Metals site as I write this and see that 2018 Canadian Maples (with the privy mark that didn't exist in 2008/9) are selling for $16.17. So much for that killer buy from 9 years ago. Now if someone regularly adds to their stack at varying prices over time, more power to you. Someone who went all-in at that time and didn't have money to buy more since then is likely hurting right now. I'm probably going to end up with some "free" silver. I took my daughter to a college fair tonight and saw 1 of my old professors (from about 5 years ago) She said that she'd sell my old book to one of her students for me. It ought to be good for about 5 ASE's Luckily for me, they are having trouble sourcing the book right now. Schwartzy wrote: Check this one out. This is a tough one to get. It is 1 of about 300 that ended up having the error on the back. Obviously it isn't 1oz of copper. Check out this video if you want a chance at winning something. I can't believe this auction. I'm even more excited about my $70.00 purchase after seeing this today lol. Schwartzy wrote: I can't believe this auction. I'm even more excited about my $70.00 purchase after seeing this today lol. If any of you have any YPS with the serial number 20, I'd be happy to purchase it from you. If you aren't in the market to sell it because it's rare, you don't have another one, I get all that. Please don't be afraid to contact me as I have a decent collection and a good chance I can replace it with 1 of mine plus add an incentive to you. Thank you all. I only know of a few more pieces which are the 5 ounce dragon, 1 Kilo Pyramid, 100 gram Skull and 3 ounce lion #20 that's out there that I'll be snagging up soon so I'm open to hear what any of you might have. Thank You. Omg. Look at this auction go! I can't believe it!! 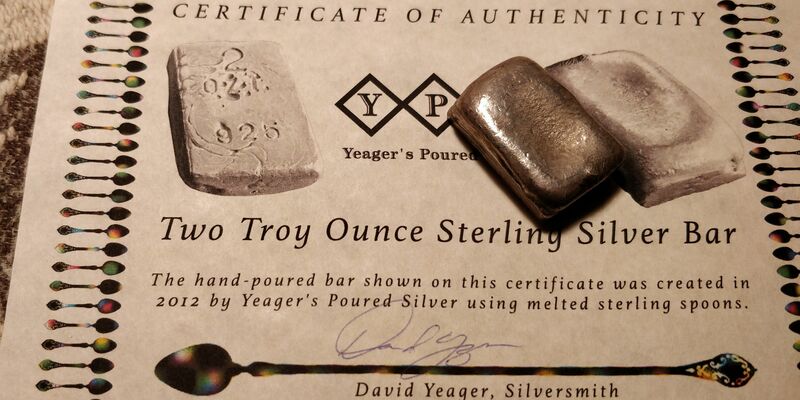 Proud new owner of the two ugliest bars ever produced by Yeager's Poured Sterling. 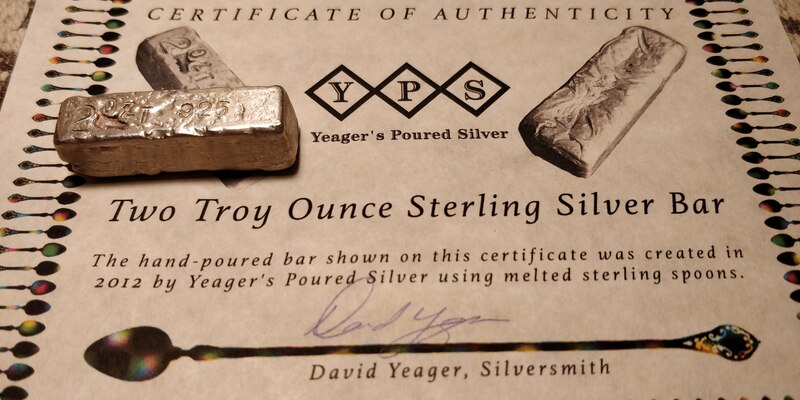 Silversaving wrote: Proud new owner of the two ugliest bars ever produced by Yeager's Poured Sterling.